Location/ Directions: From all directions. 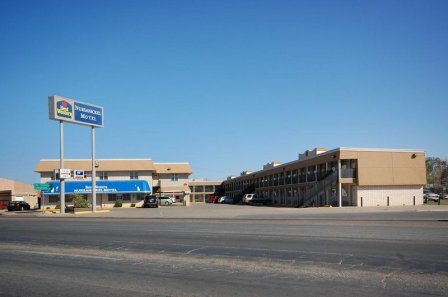 The Best Western is located at the junction of Highways 87/385 and 54. Flat screen LCD 32" Cable TV, Iron/ironing board, Hairdryer, AM/FM alarm clock, Free wireless high speed Internet, Free local calls under 30 minutes. Railroad View: Expect a Good to Excellent View. Any room with a view of the street will have a view of the railroad. Railroads past Hotel: BNSF Railway. Westbound Directional Running. Not a very busy line, expect no more then 6-10 trains during a 24-hour period. Photo Comment: Google Street photo shows the motel to the left, and the railroad across the street. This is not a busy railroad line, during my visit to Dalhart only two trains passed on this line during my 12-hour stay along this line. Location/ Directions: Take Highway 87 South to Liberal Street. About Hotel: 2-Floors, 43-Rooms, Interior Corridors, Business Center, Free Breakfast, Ice Machine, Laundromat, Vending Machines, Fitness Center, Indoor Heated Pool, Spa, Pets Allowed, High Speed Internet Access, Adjoining Rooms, Air Conditioning, Alarm Clock, Cribs, Desk, Ergonomic Chair, Self controlled Heating/Cooling, Iron/Iron Board, Washer/dryer, Microwave, Mini-Refrigerator. Railroad View: Expect a Good to Excellent View! While most rooms in this motel offer a railroad view, rooms on the front - 2nd floor may have a few less trees to contend with. Railroads past Hotel: Union Pacific. UP is the busier railroad in Dalhart, complete with a train yard and locomotive servicing area. Much of this yard can be seen from the motel. Photo Comment: A Union Pacific locomotive and train is seen next to the Days Inn motel. The railroad boarders the motel property. This motel offers a better railfan experience as compared to the Best Western (also listed on this site). Location/ Directions: Travel South on hwy 54 to 7th and Denver and turn left. Continue east on Denver which turns into Liberal approximately 3 miles. Hotel is located on left hand side of Liberal. About Hotel: 2-Floors, 51-Rooms, Interior Corridors, No Pets Allowed, Business Center, Health and Fitness Center (On-site), Indoor Pool, Daily Housekeeping, Ice Machine, Color Cable / Satellite TV, Work Desk w/ Lamp, Speakerphone with Voice Mail, Free Local Phone Calls, Bathtub, Hairdryer, Private Bathroom, Scale, Free High-speed Internet Access, Coffee Maker, Microwave Oven, Mini Refrigerator, Connecting Rooms, Crib, Individually Controlled Air Conditioning, Iron / Ironing Board, Rollaway Bed, Windows Open by Guest, All rooms non smoking. Railroad View: Expect a Good to Excellent View! You need a room on the front side of the motel for a railroad view. Some trees around the motel limit what can be an excellent view. Ask to check the view from the room prior to accepting. Photo Comment: The Google Street image shows the Holiday Inn Express. Auto-Rack freight cars in Union Pacific's Dalhart Yard can be seen to the right.